When Marine Jay Knight returned home after two tours of duty in Iraq, he knew his mission was not complete. His good friend and fellow member of Mobile Assault Platoon 2, Lance Corporal Johnny Strong, was killed in action in 2007. 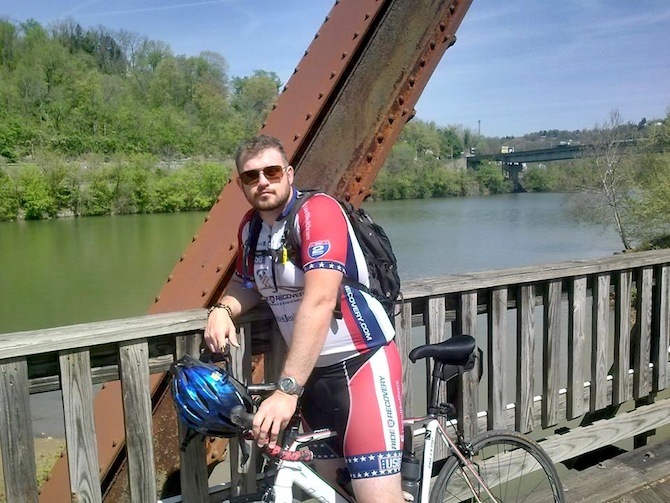 Knight wanted to “help his memory live on in a way that exemplifies his aspirations and caring heart.” Since Strong was an avid video gamer and aspired to learn how to create games, Knight decided to honor him by cycling across the country to raise money for Child’s Play, a charity that provides games and other welcome diversions for children in hospitals. One little detail—that Knight was not an avid cyclist—was no deterrent. 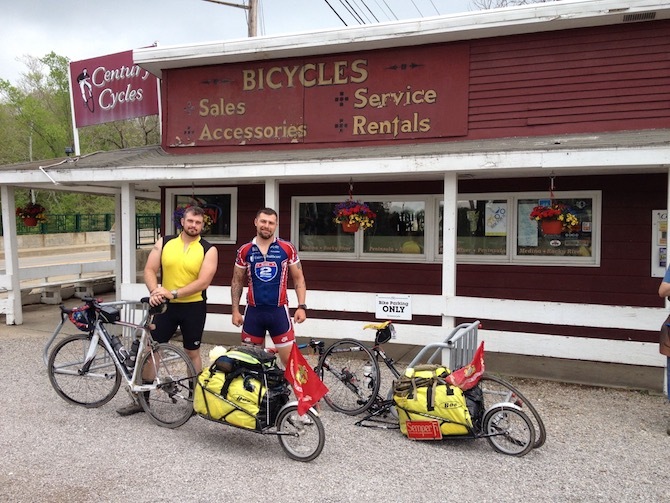 Jay and Denny stop at Century Cycles in Ohio. Photo courtesy of Ride 2 Recovery and Pax2Pax. Things got tough on the very first day of the ride. Knight had purchased a carbon fiber race bike, a Raleigh Militis 1*, planning on traveling light with the aid of a SAG wagon. But the support did not materialize, so he ended up towing a trailer stuffed with gear. 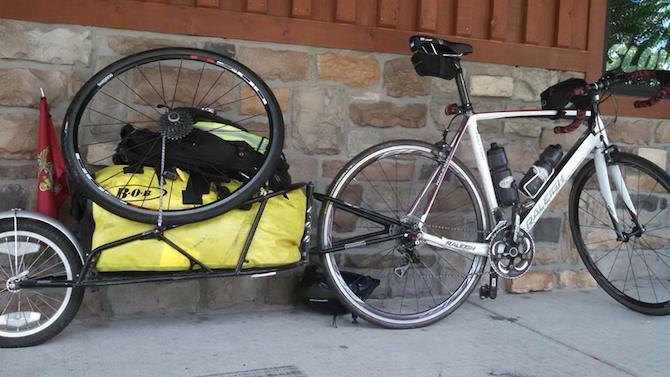 “That was probably the only day I felt like quitting…it was the first time I rode with a trailer on a bike, was not used to it, and had to cover 78 miles with hills.” Over the course of the ride he learned to handle the 80lb beast hanging off his back wheel. He worried that the frame would not handle the stress, though the bike handled perfectly. Jay’s Militis 1 ready to haul supplies for the four month trip. Photo courtesy of Ride 2 Recovery and Pax2Pax. PHOTO COURTESY OF RIDE 2 RECOVERY AND PAX2PAX. 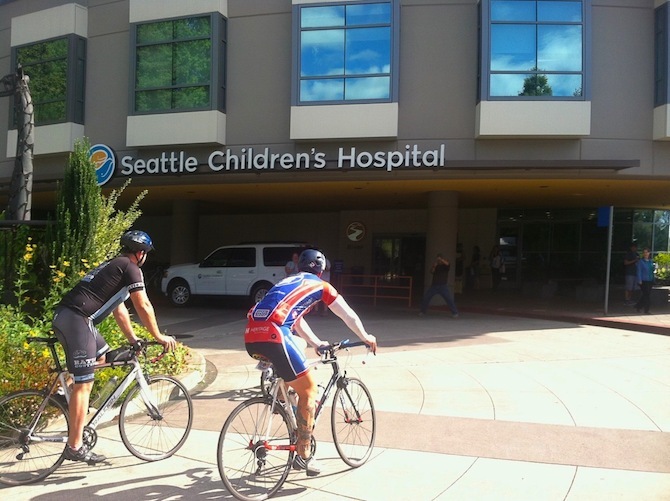 Jay and Denny ride up to the Seattle Children’s Hospital. Photo courtesy of Ride 2 Recovery and Pax2Pax. After reuniting on the road out West, Knight and Salisbury made it to Seattle in time, and raised $14,700 along the way for Child’s Play. Knight says he is planning to write a book about the trip. And how about another trip? “I have made plans to do some cycling in Europe, but I don’t see myself wanting to do another cross-country trip,” he says. But this trip accomplished so much more than most. *The Militis 1 is not designed to take the load of a trailer, and we do not recommend this particular use for these bikes.